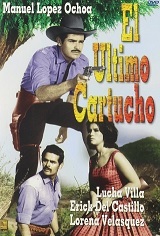 Led by the ruthless El Figurin (Eric del Castillo), a band of outlaws forcefully takes over the land and operations of local farmers in a bid to extort money for the use of their own water for irrigation. But when Captain Austucia (Manuel L�pez Ochoa) catches wind of the diabolical plan, he is more than willing to defend the working man and do away with the bad guys once and for all. Also stars Lorena Vel�zquez and Lucha Villa.